The young Mongol scholar Dorje Banzar, published a book in 1846 in Russian at the university of Kazan that brought to light for the first time the old religion of the Mongols to the scholarly world. In the 1960s, M. Jaadamba, a descendent of Chingiz Kha’Khan, along with a group of Mongolian workers brought to light several texts and incantations of the ancient Mongol ritual that had never been seen before. We have alluded to some of these incantations on these pages before. This old religion of the Mongols has been considerably diluted by the missionary activity of the tAthAgata-s but remains in certain pockets of steppe eking out a precarious existence. Along with the hoary Shinto tradition of the eastern islanders it remains one of the important documents of old Eurasian ritual expression. We had early pointed out parallels between to Mongol fire ritual and the ancient Hindu one in the veda. We had also pointed to the interactions of the Mongol tradition with the Indo-Aryan and Iranian traditions, with elements such as the the nakShatra mantra-s, the equation of Köke Möngke Tengri with Ahura Mazda and the invocation of Darqan Guejir Tengri. the ritual practice without writing! You my three teachers, he hi hi ! With my unwritten ritual teaching, he hi hi! You who see no shramaNa or vajrAcharya. 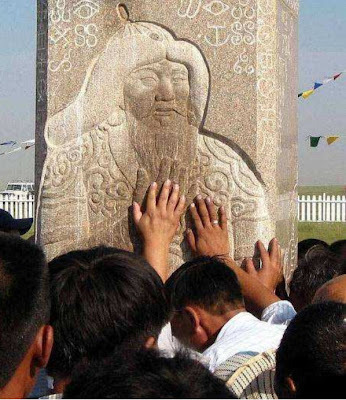 Alternatively, he is publicly worshiped at large stone steles, which bear his image, erected on the steppes in the manner of the balbal stones of the ancient Hun Khans. Rituals at the founding of the Mongol nation might be compared to the rituals performed by bharata dauHShanti to indra and other deities at the foundation of the Hindu nation; an old gatha is remembered regarding his great ashvamedha-s and his name is taken at the beginning of all shrauta rites where the ritual fire is declared as belonging to the bhArata-s. The promulgation of new rituals at the founding of nation are important for a nation’s identity. A parallel might also be noted with respect to the promulgation of new rituals with the emergence of the unified Hindu nation in northern India after its complete conquest by janamejaya pArikShita. On the occasion of his indrAbhiSheka, tura kavasheya who was previously rejected by other brAhmaNa-s, was declared as the chief ritualist. At the directive of janamejaya the shrauta system was unified along with the composition of a new AprI for the ashvamedha by tura kavasheya that is preserved in the yajurveda. The last can be compared to the ritual offering to the gArhapatya fire in the Hindu tradition. 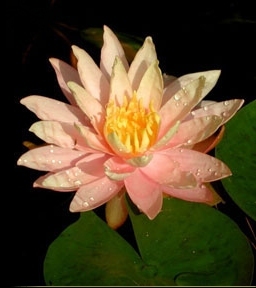 The word shu-ma or su-ma has been interpreted by the chIna-s as “distant hemp”, with the ma being the same as in huang ma, but the plant itself was believed to be mythical by many. As Zhang He points out this is clearly soma itself. Thus, one may infer that the rulers of the chu state probably emerged from a hybrid of an Indo-Iranian tribe with a Mongolic tribe (the Hun) and observed Indo-Iranian-type fire and soma rituals before being assimilated completely within the chIna world. Thus, we have reasonable evidence for Indo-Iranian influx very early in the history of the Altaic tribes, before bauddha-mata ever reached them or the chIna-s. While the soma ritual appears to have died down the fire ritual was certainly retained and renewed in various forms through their history. This is followed by a verse incantation to the Suelde deities. The Dalai Lamas declared that the Suelde deity was the same as mahAkAla and homologized it with the dGra lha tradition of the Tibetans. The formalization of the ritual appears to have emerged at the time when Temujin acquired the title Chingiz Kha’Khan in 1206 CE. We know from some material preserved from the earlier Uighur Khanate that there were followers an Iranian religion, Manichaeism, in their midst. Genetic and physical anthropological studies reveal that Uighurs have a major Indo-European admixture. We know that the Chingizid Mongols were close to the Uighurs, e.g. Alaltuen, daughter of Chingiz and Boerte, was married to the lord of the Uighurs and was the viceroy of the Kha’Khan in the Uighur state. There is ample philological evidence for Uighur to Mongol transmission of religious terms So one could argue that the Iranian influence came via the Uighurs. We do not see this as likely – whereas the earlier Uighur Khanate was certainly influenced by Iranian religions, examination of the Uighur texts of those affiliated with Chingiz shows that they lost Manichaeism and followed the mAhAyAna and vajrAyANa streams of the bauddha-mata. Moreover, we do not see any evidence for the dualism of the Manichaeism in the Mongol or later Uighur tradition. Hence, suspect that that Iranian influence actually belongs to the earlier period. Some clues for the earlier Iranian transmissions come from an unexpected source, namely the Japanese Shinto tradition. In the period before 250 CE (Yayoi period) there is no major presence of horses in Japan. Sometime after 250-300 CE (the Kofun period) for the first time one sees horses coming into prominence, with their depiction and of chariots being a major feature of the art of this period. A key Shinto ritual is leading of the holy white horse before the goddess Amaterasu three times a month at the Ise shrine, the holiest Shinto shrine whose ritualists come from the emperor’s clan. On mythological and philological grounds we can say that the Shinto tradition per say is an ancient Eurasiatic tradition whose primary deities emerged in some form before the introduction of the horse to the islands. However, the coming of the horse clearly had a major impact with it being incorporated whole scale into the ritual. In some form, a ritual parallel to the the leading of the holy horse before the Ise shrine was already in place at beginning the Kofun period (the Japanese chronicles refer to emperor Suujin dedicating a horse to the Shinto deities). Importantly, along with horses in the Kofun there are also images of horse-borne warriors who look just like the Shaka-tigrakauda – a depiction not seen before or after in Japan. Both their non-Japanese facial appearance and the tigrakauda (the pointed hat just as in the Iranian carvings of Darius) strongly suggest that these are not natives but the Shakas who got the horse from central Asia to Japan. The other key feature is the ancient mirror used in sun-worship by the Shakas (e.g. the case made recently by Vassilkov for the use of Hindu mirrors in pre-maurya times by the Shakas on the steppes). which appears to have become part of the Shinto tradition around this time. We may note that the Japanoic languages have a distant relationship to the Mongolic, Turkic and Tungusic languages suggesting a common origin. However, the old Turkic and Mongolic people have rather similar religious traditions and legends that share many features that are not seen in Japan. This indicates that there was a considerable development of the continental Altaic tradition after its separation from the island version. We suggest that the above discussed Indo-Iranian these transmissions are part of this divergence and that it happened over a prolonged early phase of interaction that culminated in the conflicts of the Shaka and Kushana with the Altaic tribes. This eventually resulted in the defeat of the steppe Iranians and their expulsion from their ancient seats. But in the process the continental Altaics had absorbed many of their traditions. This is also reflected in the genetics of the Huns: Among the people whose DNA was recovered from the Hun cemetery in Duurlig Nars, Northeast Mongolia (~20-0 BCE), there was one with the typical Indo-Iranian R1a1 Y-chromosome alongside others with North-East Asian markers. Some of the steppe Iranians fled towards India with which they had deep and long-standing cultural connection. Another a group appears to have reached Japan and transmitted the use of the horse along with several elements to the Shinto religion. But these transmissions were not identical to the transmissions seen in the continent and might have in fact led to a divergence in the Shinto practice from its old Altaic state. For instance, the transformation of the role of the Miko ladies from the old Altaic shamaness to a ritual assistant appears to be part of this process. Footnote 1: This festival is the backdrop of the hostilities between the Taidjuts and Hoelun the mother of Chingis Kha’khan, where the latter gets driven out along with her young kids. Footnote 2: Jelme was one of the great Mongol generals who saved Chingiz’s life when he was struck down by an arrow of his future general Jebe in the battle with the Taidjuts. Jelme treated his wound and stole curds from the Taidjut camp itself to feed Chingiz and keep him alive. He was the brother of Subedai another great Mongol general who subjugated the Rus. Footnote 3: Boerte was the principal wife of Chingiz and is worshiped by Mongols as an ancestress along with him. She was the mother of all his primary successors Jochi, Chagadai, Ogodai and Tolui. Footnote 4: Boghorju was one of the great generals of Chingiz. He helped the latter when the two were just boys and Chingiz’s horses were stolen. The two went on a recovery expedition where Chingiz killed the thief even as he was trying to lasso Boghorju and recovered the horses. 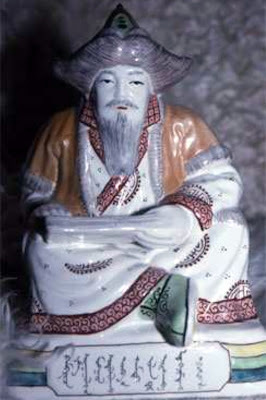 Boghorju was the chief commander of the Mongol armies in the northern campaigns. Muqali was the other great general who was the chief commander in the Chinese campaigns. This entry was posted in Heathen thought, History and tagged buddhism, Chinggis Khan, Indo-Iranian, Mongol religion, Mongolia, Tengri. Bookmark the permalink.